Sandbridge Beach is an angler’s haven. You can fish in saltwater in the morning and switch to freshwater in the afternoon, relax with a pole on the pier, cast from the surf, or take an all-day fishing charter offshore. There’s always something biting at Sandbridge, and there are plenty of places to fish in peace. Here’s a list of what’s running in spring, where to find them, and how to catch them. Atlantic mackerel is a flaky whitefish that only needs a little butter and salt before grilling. Mackerel are abundant around Sandbridge, and are best caught by jigging over schools of fish. Use your own boat outside of the surf or take an offshore charter to find them. Black or Red drum fish have a sweet and mild flavor that lends itself well to rubs and marinades before grilling. Use whelk, clams, crab, or jigs to cast into running schools of fish at dusk, and watch for diving birds to show you where they are. From the beach, wade to the sandbar just past low tide, cast toward the ocean, and wait for fish to run as the tide comes in. Bluefish is delicious baked in any citrus-based marinade. Though most bluefish are found offshore, you can sometimes catch these large fish by surfcasting with cut bait. Bluefish can weigh up to 25 pounds, so if you’re surfcasting, be ready for a workout. Croaker is another tasty, mild fish that only need a little butter and salt before grilling. They are attracted to crab, worms, and shrimp and can be easily caught by bottom fishing from a boat, by casting off of the Little Island Pier, or into the surf from any beach. Local anglers also like the Back Bay boat ramp for finding croaker in the evening. A perennial favorite, there’s nothing better than fresh flounder with breadcrumbs and Parmesan cheese. Flounder are fun to catch on live bait while drift fishing, slow trolling on the bottom, or surfcasting from the beach. If you’re casting from the beach, make sure your bait clears the sandbar. Little Island Pier and near the Sandbridge Market beach are favorite fishing holes for flounder. Gourmands like to prepare this sought-after sea trout with a mustard base and seasoned breadcrumb coating. You’ll have the most success catching gray trout with artificial lures or small live bait. 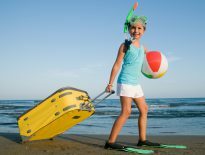 Cast into schools from a boat or surfcast at dusk when schools are running parallel to the beach. Striped bass taste best when prepared with a simple mixture of butter, garlic, onion, lemon, and sea salt. Use artificial lures or live bait to troll from a boat, or cast off of Little Island Pier. If you want to try surfcasting for bass, watch for diving gulls to indicate running schools. Prepare tautog just as you would flounder. You can easily land these medium-size fish by bottom fishing from a boat with crab bait. Tautog schools usually hang out near reefs and wrecks, so you may have to go offshore to find them. Everyone loves the tasty dolphin fish (also known as mahi-mahi so as not to be confused with the beloved mammal of the same name). Look for schools of dolphin fish offshore all spring and summer long. They are best caught with artificial lures from a trolling rig. You’ll need a fishing license to fish at Sandbridge Beach. Pick up a five-day saltwater and freshwater license at Margie & Ray’s Crabhouse on Sandbridge Road. If you have your own boat, you can launch at Mill Landing Road Ramp, North Bay Shore Campground, Owl Creek Boat Ramp, or Rudee Inlet. You can also fish from state-owned ramps such as Mill Landing and Back Bay Landing. For pier fishing, the 400-foot Little Island Pier is great for getting your line in deeper water without a boat. In Back Bay National Wildlife refuge, Back Bay is a brackish lake that has a healthy fish and crab population. The tributary creeks that feed into the lake are teeming with largemouth bass, crappie, and bluegill in spring. Bank fishing is limited on some creeks, so check your license before you cast. The best surf fishing is also in Back Bay National Wildlife Refuge. The beach past the ranger’s shack is a popular spot for anglers because no swimming or surfing is allowed. If you’re new to offshore fishing, it’s best to hire a charter. Your charter will come with an experienced guide, safety equipment, and fishing gear. Most offshore trips require anglers to get at least five miles into the ocean, so prepare for an intensive day on the water. If you don’t mind getting out of sight of land, you’ll be rewarded with big fish and bigger tales to tell. 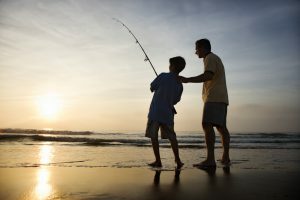 From intense offshore trips to relaxing casts from the pier or beach, Sandbridge Beach has a variety of fishing opportunities to suit all budgets and levels of ambition. Previous Previous post: Virginia Beach Sunrise: Memory Monday April 3, 2017. Next Next post: Putt Putt Anyone? : Memory Monday April 17, 2017.